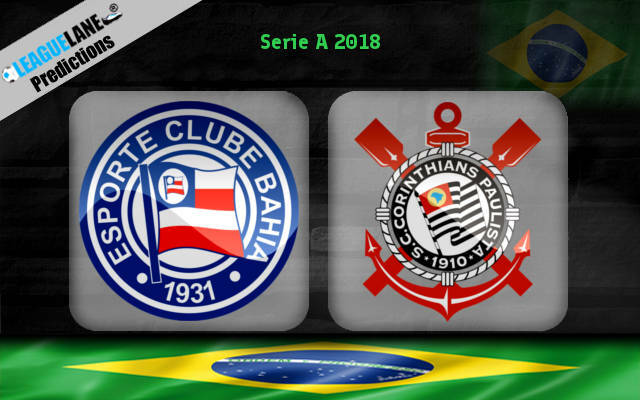 In the 12th round of Brazilian Serie A, Bahia are going to take on Corinthians at Arena Fonte Nova. The hosts are in a pretty bad form recently as they managed to pick up just a point from the last four occasions. They have won only nine points and celebrated two victories so far in the season. Claudio Prates’ side is having severe troubles in the back as they have one of the weakest defences in the competition. However, Bahia have lost just once when playing in front of their fans this season. Corinthians also cannot be proud of their performances in this campaign as they are sitting on the 9th place, managing to book just one victory in the last five matches. Their winless streak extends to the last three matches and although Henrique and the lads have been pretty tight in the back, their attacking work should improve. However, the visitors still have the chance to catch up the teams in the top four. The visitors have been more successful in their recent head to head clashes, but in the last five occasions both sides have booked two wins each. Their matches are usually moderate scoring ones, but those at Arena Fonte Nova have been pretty tight. Corinthians are slight favourites in this one, but it wouldn’t be surprising if they clash ends with a draw. Bahia can put a very good performance in front of their fans where they’ve won all their points so far in the campaign. Since the hosts are having troubles in converting their chances into goals, while Corinthians are not allowing many goals. Therefore, in this one the crowd shouldn’t be able to see more than two goals in total. Under 2.5 FT @ 1.85.